What is your favorite painting? If you are a very artsy person, that might be kind of difficult to answer. For the average Joe like me though, we come up with a list of well known paintings by well known ‘masters’ of the European Renaissance Era or some guy named Van Gogh. Paintings like the ‘Starry Night,’ ‘The Last Supper,’ and the ‘Birth of Venus’ are definitely worthy of attention, no one is disputing that, but what makes them ‘masterpieces?’ Is it that they are really that good, or do we feel that way because everyone else has told us that they are? This is a question I have been debating with myself for some time now, and I am not much closer to an answer now than when I first thought it up. There are two themes however, that I think should definitely be precursors to ‘masterpiece-ness:’ innovation and overall difficulty of the piece. By this definition, the paintings in Hospicio Cabañas definitely qualify as masterpieces of art. 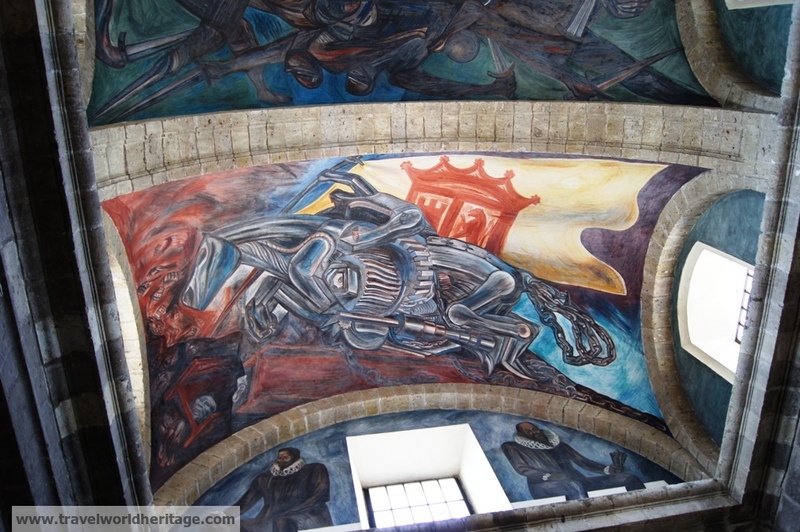 While the art in Hospicio Cabañas is not well known to the outside world, the work of Jose Clemente Orozco is legendary to Mexicans. He is considered one of the top three Mexican painters ever, along with the likes of Frida Khalo and her husband Diego Rivera. His paintings on Hospicio Cabañas are made largely on curved surfaces. Orozco used this to his benefit as his paintings look different depending on where you are standing in the room.